Grace Ridge Retirement Community is a place that celebrates and empowers independence. We also believe health encompasses mind, body and mood, and that a good mood is integral to total wellness. So, when we discovered a program that exercises mind, body and soul all at once, we knew it was the perfect addition to our Good Moods wellness and events program. Conductorcise® combines an upper body workout with a music lesson. The program, created by the renowned Maestro David Dworkin, can be shaped to address specific challenges or needs. Participants can expend as much or as little energy as preferred, ensuring everyone has the chance to experience the total health benefits of Conductorcise®, including stress relief, aerobic stamina, cognitive stimulation and increased circulation. Grace Ridge is the only continuing care retirement community in North Carolina certified in the program. 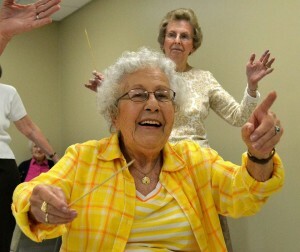 Today, Conductorcise is led by our own life enrichment director Evelyn Beaver. The program is a resident favorite and an integral part of the Good Moods lifestyle.